Fantasy Warplay also offers Birthday Party and Events Packages with various options and choices as well as scaled down version for all age groups. The parties can be anything from complex riddle quests to pitched battles. We have done everything from unicorn quests lead by faerie princesses, to pirate ship battles, to Harry Potter, to ancient Greece. Anything is possible with the active imagination. $50: Basic Battles. These parties revolve around games that use the weapons–capture the flag, hunger games, etc. They don’t have any storyline. $100: Simple Adventure. These parties involve battles with a simple storyline, with monsters and heroes. $150: Complex Plot. These parties feature a fully fleshed out adventure with riddles and twists, customized. Parties with complex plots must be a minimum of 2.5 hours long. $200: Custom Plot. Do you want a party based in the world of Harry Potter, Lord of the Rings, or other specific setting? This is the package that accommodates that. Parties with custom plots must be a minimum of 2.5 hours long. Hourly Rate: $5 per child per hour. Staffing Charges: $100 flat fee, to be paid in advance when your party is scheduled. (Optional) Birthday Item: $50 for an item chosen out of our Birthday Item Inventory which your child gets to keep. Travel Fee: Most of our teams are based out of the Palo Alto CA area. If you want a party further South than Mountain View or further North than San Mateo, we charge a travel fee to cover the expenses of gas and travel time. This fee is based on distance. To figure your travel cost, multiply the number of hours it takes to get there from Palo Alto by $50. One hour of travel (one way) is $50. Two hours of travel $100, Three hours of travel $150, etc. The Game World Sampler: $400. 2 hours of play for up to 20 kids. 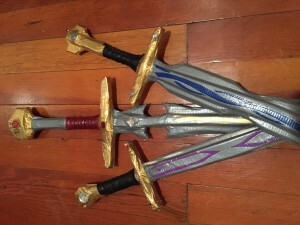 This is ideal for players new to the game who want a taste of what LARP is all about. We start out by teaching the kids how to play, and then move into a simple adventure story set in the game world of Roekron. The Complex Adventure: $500. 2.5 hours of play for up to 20 kids. This event offers a more involved storyline ideal for players with a little bit of gaming experience. These adventures have complicated plots that often involve riddles, puzzles, and interesting choices. They are usually set in the game world of Roekron. The Themed Adventure: $550. 2.5 hours of play for up to 20 kids. This event is completely customizable by you. If your child has an interest in a specific book series or fantasy world, we customize an adventure to fit your child’s interest. These adventures have complicated plots that often use riddles and puzzles to be solved by the kids, and are set in a fictional world of your choice. When we agree on a date and time for your party, you pay our staffing charge of $100 for that spot. This deposit is non-refundable, but if you need to reschedule it will remain in place and continue to count towards your party–you do not have to pay it again to reschedule. We do not reschedule parties less than a week before the agreed upon date, except in case of rain. 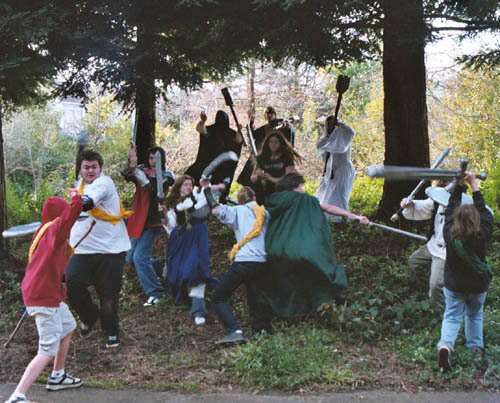 There are a number of safety concerns regarding LARPing in the rain, so if it is forecast to rain on the date of the party, we will work with you to reschedule to a date that works for you. We do not run parties in the rain. “This is the best day I have ever had.” one of Julians girl friends from Waldorf school, age 10. “This is the most fun I have ever had. This game is awesome.” Jason, age 15.